There are two Alaska luxury fishing lodges that are located at the gateway of the Katmai National Park and Preserve. 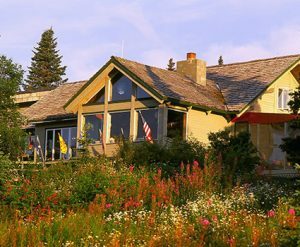 Located in the heart of the Bristol Bay watershed region, these 5 star full-service fishing resorts are the best place for expert and beginner fisherman who are looking for an unforgettable time in the pristine and remote wilderness of the Alaska. 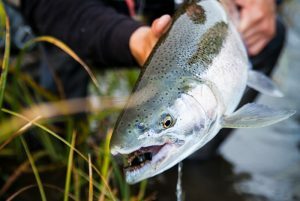 Most Alaska luxury fishing lodges are located in populated areas where fishermen are subjected to having to fight for a place to fish on the riverbank. This is not nearly the case at the Alaska Sportsman’s Lodges. Our lodges are surrounded by snow-fed rivers and streams as they flow from the mountains, across the tundra, and through the Bristol Bay watershed on their journey to the sea. Both of our Alaska luxury fishing lodges are located on world class rivers in prime Alaskan terrain. The Naknek River and the Kvichak River are the top salmon runs in the world, and our Alaska luxury fishing lodges give you the chance to enjoy it in luxury and comfort. Our Alaska Sportsman’s Lodge is located along the Kvichak River, which is a clear water river that is home to millions of salmon. It is located merely 4 miles from the Iliamna Lake, which is the final destination for the salmon swimming furiously from the sea. Therefore, these salmon swim right past the front porch of this rustic resort. Not only are they on world class rivers, these are world class places to stay. In fact, The Orvis Company recognized our Alaska Sportsman’s Bear Trail Lodge as North America’s top fishing lodge in 2005. This lodge is located right along the Naknek River, which is famous for its five species of salmon and is home to huge Rainbow Trout. Each of our lodges offer the best fishing experience you will find. We provide individualized attention and instruction to each of our guests by assigning one guide for every two people. Our lodges and our prime locations attract guides are the top experts in the world. They know the ins-and-outs of the type of fish, the rivers in the areas, and the fluctuation of the migration of the fish as the season unfolds. Fly-out programs are also included in our packages. So guests have the option of sticking around the prime fishing locations near the lodge, or they can choose to explore the surrounding waters and wild terrain of the nearby Alaskan wilderness.